The first day of my junior year of high school, I sat in religion class (Catholic school girl all the way! ), waiting for the bell to ring to signal the start of class. I was happy to see a lot of my friends or students I knew from my honors classes trickling in quietly. But then he came bounding in: a wiry-haired, skinny boy with glasses and the biggest smile I’d ever seen, accompanied by an uproarious laugh. His constant loud laughing, goofing off all the time, just overall making, what seemed to me, a fool of himself, irked me ferociously. Why couldn’t he just shut up? I dreaded that class and his nonstop interruptions. Then one day a friend told me she was dating him. “Yuck! Why? !” I exclaimed. “He’s fun,” she said with a smile. They broke up shortly thereafter — as most high school couples do — and later I found myself out socially with him and a few other people. I got to know him a bit better and realized something: My friend was right! That annoying boy was fun. He was funny, he liked the same bands I did, and he was able to see me as more than just the quiet girl in religion class. As you might imagine, that extrovert and I fell in (teenage) love. While the relationship didn’t last longer than my first semester of college, our introvert-extrovert balance did set the tone for the rest of my romantic relationships and some of my friendships. There’s something about the loud goofball that I tend to gravitate to. And it always starts the same way: the loudest, most annoying person in the room grabs my attention — and irritates me. But more often than not, I get to talk to him or her one-on-one, and I am happily surprised to learn that he or she is actually pretty great. And it’s not just limited to romantic relationships. A lot of the people I’ve befriended at work are the loudest, most gregarious people, who, when they get to know me, see that I’m funny and witty and kind. We’re both happily surprised at what we find out about each other. This got me thinking: As a passionate introvert who loves my quiet time, why am I attracted to those opposite, loud, outgoing personalities — and why are they attracted to me? I realized it’s all about balance and we actually need each other. In fact, we can often accomplish great things when we are together. As Susan Cain points out in the TIME article, “Don’t Call Introverted Children ‘Shy,’” “Many successful ventures are the result of effective partnerships between introverts and extroverts.” So, here are four reasons these opposites-attract relationships work well. 1. Introverts will actually listen to the extroverts. My extroverted friends/boyfriends enjoy my company because they can, it seems, relax a bit. They don’t have to be “on” all the time, and they know they are safe talking to me about whatever they want without judgment. They’re talkers, we’re listeners; it makes perfect sense. 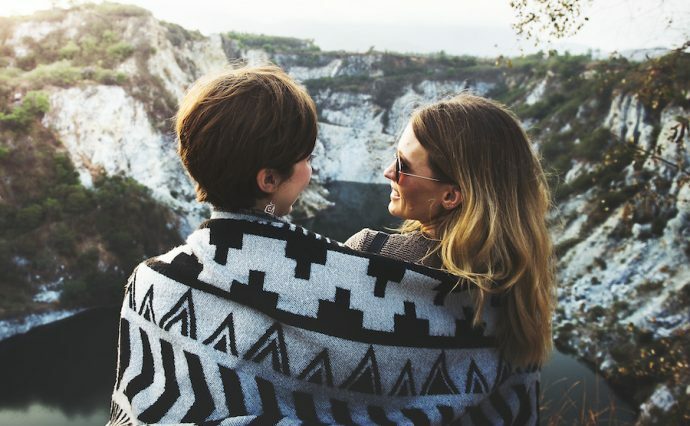 An extrovert-extrovert friendship or relationship is great for parties or loud, people-filled adventures, but when they need to be heard, extroverts can rely on us introverts to actually listen to them and give them genuine, deep advice or empathy. Sometimes other extroverts either don’t have time to listen or brush them off. Everyone, no matter what their “type,” has moments of introspection and crave connection with others in some way. I find that I bring out those moments when I’m with my extrovert friends in an intimate setting. They can share ideas or feelings or opinions with me — perhaps things they have never shared with anyone else. 2. Extroverts pull us into the social mix when we want to join in. My extrovert friends amaze me: They seem to have a million friends, get hundreds of text messages and Facebook friend requests a day, and know where all the fun parties are. While that kind of nonstop social activity would tire me out after about a day — and I am very aware of that — I still get a little jealous. Going to a party alone is a terrifying thought — and something I’d never ever do. But my extrovert friends are the perfect people to link arms with and saunter into a party or loud bar. Extrovert friends are my gateway into that world. We have fun, and I’m just a little more talkative and social than I normally might be because I have that “safe” person I know I can talk to. 3. Introverts are dependable (for the most part) and loyal. As an INFP personality type, I pride myself on my loyalty. (What’s your personality type? We recommend this free personality test.) And while sometimes I can be loyal to a fault, my close friends know they can count on me any time, which I value. I am naturally empathetic and am able to help them in situations where they are feeling hurt, frustrated, or just plain upset. Because my connection to them is deep, and I’ve been there for them every time they need me, my extrovert friends know I will be there no matter what and not flake on them. I am the person they know will be there even after the music stops and the party is over. 4. Extroverts often bring out the best in introverts and help us to develop our “other” sides. Extroverts bring out parts of me I don’t always show or even acknowledge. I am quiet almost all of the time, and I am steadfast in my need for daydreaming and deep thinking, but sometimes I need to be challenged a bit. And that’s where my extrovert friends and coworkers come in. Dr. Jennifer Kahnweiler, author of The Genius of Opposites, and researcher of the differences between extroverts and introverts notes, “When we work closely with our opposites, we are stretching into our own opposite sides.” Those extroverts in my life stretch me in a way that makes me feel safe to take a risk I may not otherwise take, either on my own or when surrounded by other introverts. For example, I feel slightly more apt to speak up at work or in a social setting when I know my extrovert colleagues or friends are there to support me. I love my observational, quiet considerate self who listens first and ponders what the group is saying. But I know there are times when I have to speak up. It can be daunting and scary, but with the support of the natural talkers in my life, I feel more confident and willing to let my voice be heard — out loud.